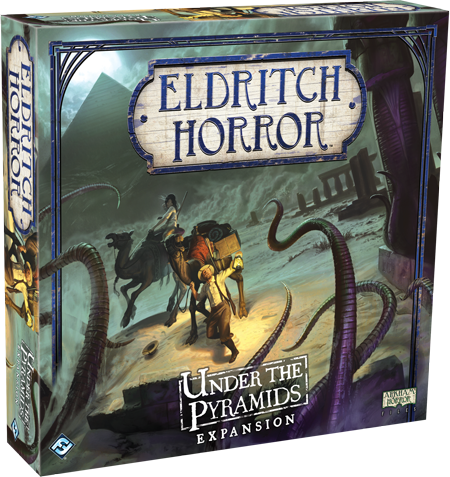 Fantasy Flight Games is proud to announce the upcoming release of Under the Pyramids, a side board expansion for the cooperative Lovecraftian board game, Eldritch Horror. In the chaotic streets of Cairo, saddled camels stand in front of parked roadsters. Arab merchants are bartering with British officers and Hungarian archeologists, while Bedouins find refreshment at cafes after spending months wandering in the Sahara. Just outside the city limits flows the wide, shimmering Nile River and only twenty miles away, the Great Sphinx patiently guards a famous trio of Old Kingdom pyramids. And only a few hundred feet from the entrance to the Cairo bazaar, a group of black-robed Cultists chants solemnly in a mysterious and archaic language, summoning back to life the cruelest Pharaoh of all time. Under the Pyramids invites you to discover Egypt’s secrets as you battle against the Dark Pharoah’s return. A new side board opens up six Egyptian locations, from bustling cities to legendary archeological sites. Six preludes introduce challenging new horrors, including a lethal, unnatural epidemic and the ghostly return of a fallen investigator. Eight more investigators enter the international fight against evil, armed with mysterious Relics and powerful Glamour Spells that can actually alter fate . 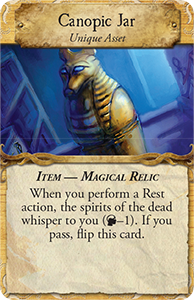 You’ll need a strong and well-equipped team to take on the terrible Ancient Ones who have slept silently for millennia in Egypt’s sands, but now threaten to awake. Everywhere in Egypt ancient and modern come together. Military speed boats dart back and forth over the massive stone ruins of the Alexandria lighthouse. Academics and tourists toting cigarettes and cameras throng around the pharaoh Akhenaten’s sandstone palace at Tel El-Amarna by the Nile. As the midday calls to prayer ring out over Cairo, Egyptian separatists clash with Imperial officers and bureaucrats feud over rightful ownership of the Rosetta Stone. Amidst all this, you and your fellow investigators are undertaking a secretive struggle against the Ancient Ones. You may see the face of a cat goddess in the stars or foresee your own death in the misshapen shadow of the Bent Pyramid. 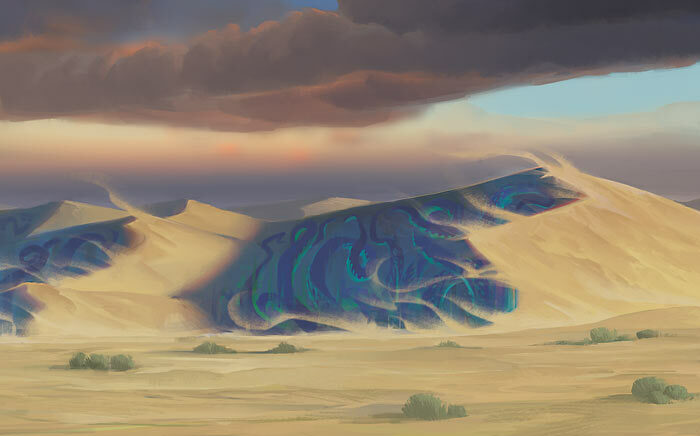 Your search for clues will lead you down the length of the Nile to the Sudanese border and from the shores of the Mediterranean deep into the drifting Saharan sands. You may also discover that your friend Erich Weiss has been framed in the theft of a priceless pharaonic amulet. 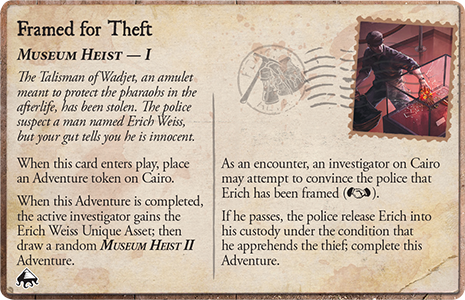 The Museum Heist Adventures launch you on a chase across Egypt to catch the actual thief, retrieve the amulet, and clear Mr. Weiss’s name. Since long before the historical era, nomads have roamed across Egypt’s deserts, stopping at secret oases on the way to trade in Cairo or rest on the banks of the Nile. 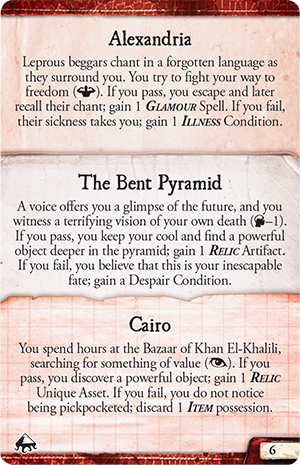 All eight investigators of Under the Pyramids are also nomads, each for their own individual reasons. Hank Samson, for instance, left his family farm in Texas in search of his long-lost father. Sister Mary found her calling in eradicating demonic presences throughout Africa. 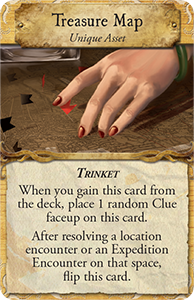 Many of the new investigators are scholars as well. Mandy Thompson and Dr. Harvey Walters have traveled to Egypt to do first-hand research into psychic abnormalities and arcane texts. 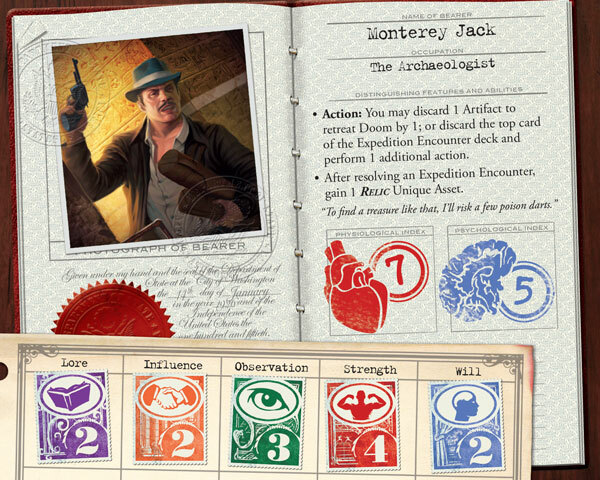 The archeologist Monterey Jack particularly unites research and restlessness. As a child he traveled the world alongside his father – but recently the aging man was found murdered. 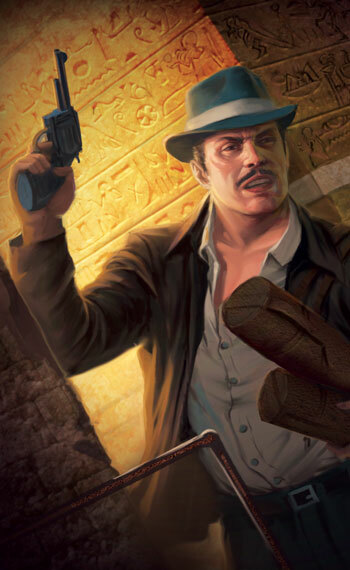 Jack has now undertaken a new investigation, seeking information about his father’s death in the ruins of ancient Egyptian temples and the labyrinthine Cairo streets. He carries with him a Treasure Map given to him by his father and has an uncanny ability to spot valuable Relics like Canopic Jars in the least likely places. The mysteries surrounding the Dark Pharaoh may prove inscrutable even to an Egpytologist like Monterey Jack or a linguistic scholar like Mandy Thompson. Little is known about the ancient king known as Nephren-ka. He was a mighty sorcerer who worshipped Nyarlathotep and a bloodthirsty tyrant who enslaved thousands and sacrificed countless innocent people to his evil god. Some Egyptologists believe that his rule ended the Third Dynasty of the Old Kingdom; others say he lived during the Twentieth Dynasty. 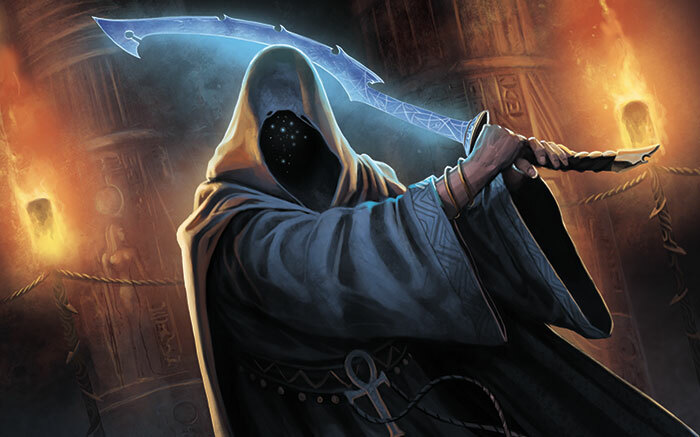 Some say he was buried beneath the Bent Pyramid and covered the walls of his tomb with prophecies; some say he was actually a flesh-and-blood avatar of Nyarlathotep and his remains vanished. His true believers say that his return is imminent. All the evidence that you can find supports their claim. 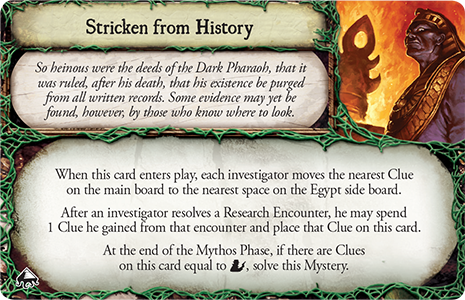 To keep the Dark Pharoah from enslaving Egypt once more, you and your fellow investigators will have to solve three mysteries. You may have to banish a tempestuous and lethal Black Wind from the Nile Delta, or even fight the reawakened Great Sphinx of Giza. Nephren-ka's history itself is a mystery much harder to solve than it may sound. After he was deposed in a democratic uprising and buried alive, the Egyptian people erased virtually all sculptural, pictorial, and hieroglyphic records about the Dark Pharaoh, striking him from recorded history . Such was their desire to purge his terrible and bloody reign from their memories. In these times of deceptive international calm, archeologists and explorers from across the world are pouring into Egypt, scouring her temples, tombs, and pyramids for artifacts and mystical knowledge. Your search, however, is vastly more important than all their scholarly excavations, for yours alone can save humanity. 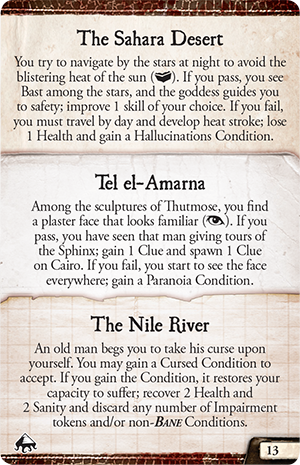 The harsh Egyptian climate will challenge your strength, the hieroglpyhic inscriptions will challenge your knowledge of lore, and the chaos of urban bazaars will test your powers of observation. You’ll need lots of influence to navigate the local and Imperial bureaucracies and a streadfast will to gaze upon the Egypt's ancient horrors. Only by facing these challenges and solving the mysteries of this truly ancient civlization can you safeguard the future of humanity. Under the Pyramids will be available in the fourth quarter of 2015. 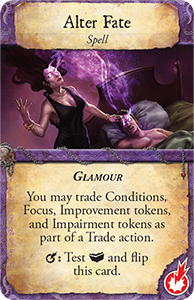 Meanwhile, the Strange Remnants expansion is now available at your local retailer and in our online store. 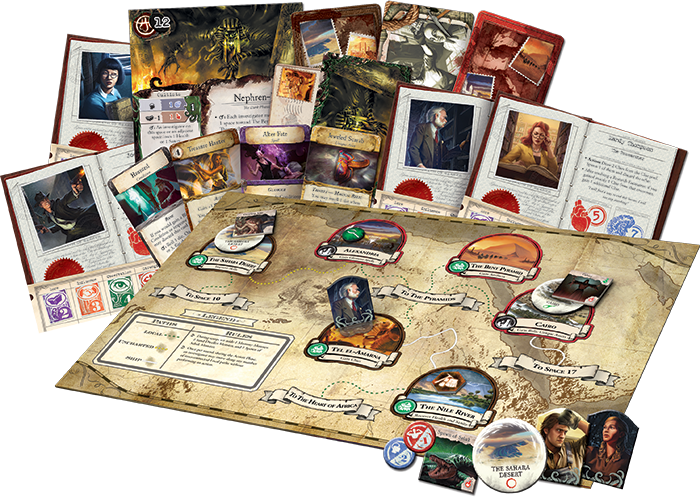 Find more information about Eldritch Horror and its expansions here!